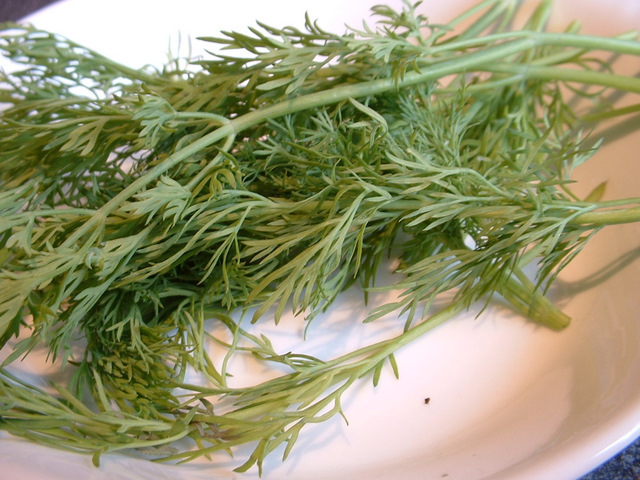 Chopping dill is a key cooking skill as herbs such as dill add great flavour to a wide range of dishes. The same method can be used for chopping most of your herbs when required. Pick the leaves of the herbs and make a pile in the middle of the chopping board. Using your large cook’s knife, hold the handle in your right hand and hold the tip of the knife on the board with your left hand between the thumb and the first finger (or vice versa if you are left handed). This is where the shoulder of the knife comes into play. Starting at one side of your pile of herbs, hold the knife tip firmly on the board and with a chopping movement bring the knife down and through your herbs, slowly working your way across the pile of herbs. Scrape the pile together and start again chopping through the pile. Continue until the herbs are chopped to the size you require. With a little practice you will find that you can do this quite quickly. Also, this is a good method for chopping onions, garlic, etc. We have put together some information on all you need to know about cooking with herbs. This includes information on basil, coriander, mint and parsley to name a few. Now you have found out all there is to know about chopping dill, here are a few recipes that use dill so you can try out your new cookery skill.